On July 3, 1863, 34-year-old Lt. 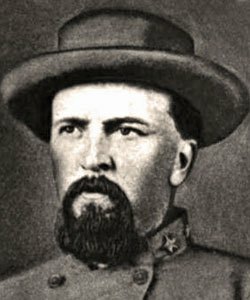 Colonel Isaac E. Avery of the 6th North Carolina State Troops died from mortal wounds he received the previous day. Shot in the neck and partially paralyzed during the Battle of Gettysburg, the Burke County native was unable to speak on his deathbed. Avery fell alone while leading his men in an attack on Cemetery Hill. He had taken command of Hoke’s brigade after Hoke himself was wounded at Chancellorsville. Avery was the only man mounted and, once found, was carried from the field. 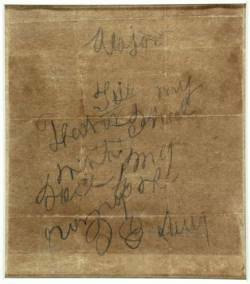 Clutched in his hand was a small bloodstained piece of paper, which has become one of the treasures of the State Archives. Though right handed, Avery was forced to write with his left because of paralysis. His letter said, “Major, tell my father that I died with my face to the enemy. IE Avery.” Major Samuel McDowell Tate, a friend from Burke County to whom the message was addressed, remained with Avery until he died.